Increases system priority of Locus Map and secures it against automatic system task killing (unfortunately, not always, see >>). 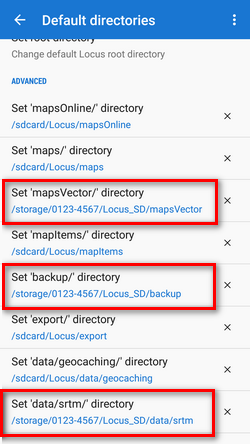 Allows customizing Locus Map default working directories. Control if you want to spend your mobile data on uploading maps, backups etc. Locus API for developers enables creating various Locus add-ons for many off-core functions. Most of them need to receive periodical information about map cursor location, GPS, recorded distance etc., for example Geocaching4Locus add-on that is very important for importing geocaches to Locus Map. Google - default search engine. Returns very precise data but is functional only on devices officially supported by Google and associated with a Google account. Resets all settings to default state after Locus Map installation. 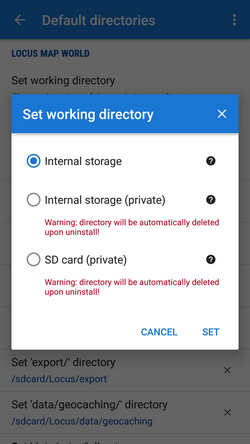 Reset does not delete your data - tracks, points nor maps.